This walk provides the opportunity to explore 3 East End Parks - the splendid (and large!) Victoria Park, the linear Mile End Park with new landscaping & features and Tower Hamlets Cemetery Park, now a nature reserve with a numbered trail. A precise route is not given for the parks especially Victoria Park which you can explore as you wish. The walk includes sections of the Regents Canal and a visit to the Ragged School Museum is recommended but this is only open Wednesdays & Thursdays 10 - 5 and the first Sunday of the month 2 - 5. There is a small cafe in this museum and in St Paul's Church (weekdays only) also a lakeside cafe in Victoria Park. Pubs, shops and cafes will be found on the main roads. Details of buses/trains are given within the text. From Limehouse Station (rail or DLR) go east along the southern side of Commercial Road. After the bridge at Limehouse Basin go down the steps to the canal (signposted Regent's Canal Towpath) and walk to the right. The path goes past Salmon Lane Lock and the site of Stepney Gasworks (on the left). The free-standing brick 'chimney' on the right is a sewer vent shaft. The Ragged School Museum is sited by the canal. The entrance from the towpath may be open if not go up the steps and around to the front. The museum has a recreated classroom and other displays. There is a small shop and cafe. There is no admission charge but donations are appreciated. This was originally a smaller park known as King George's Fields. A church stood on the site now occupied by the stadium car park. At the main road with a prominent church use the 'green bridge' to cross. Beyond the railway you may like to follow the canal towpath which goes under Roman Road. Ahead take the slope up from the towpath. The Hertford Union Canal joins the Regents Canal on the right. Cross Old Ford Road with care and enter Victoria Park at Cricketer's Gate opposite. The cafe can be reached by going along the lakeside path to the right. Have a look at this western side of the park then use the Royal Gates to cross Grove Road into the eastern half. Note: buses in Grove Road go back to Docklands. You can take time to explore the east section of the park or go via the Victoria Fountain to Gunmaker's Gate. 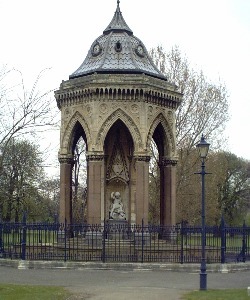 The granite and marble drinking fountain was designed by H A Darbishire and presented by Angela Burdett-Coutts in 1862 (pictured in header). Cross the canal and go along Gunmakers Lane. Cross Old Ford Road and continue along St Stephens Road opposite. The Victorian church of St Pauls by Newman & Billing was saved from demolition with the vision and fund-raising of Rev Phillipa Boardman. While retaining the body of the church as a place of worship architects Matthew Lloyd provided other community facilities including a gallery, gym and cafe. Further along on the left is the Roman Road Market. The site of the former Coburn Road Station is marked with a plaque on the railway bridge. Take the second right at Morgan Street into Tredegar Square. This was laid out in 1828. The north side was intended to immitate Nash's Regent's Park development. Exit by the opposite corner and cross Mile End Road with care into Southern Grove opposite. The entrance to Tower Hamlets Cemetery Park is further along on the left. Following the numbered posts will take you on a clockwise circuit of the park. On exiting go along Hamlets Way opposite and right at Eric Street. Mile End tube station is on the right or buses run along Mile End Road and Grove Road/Burdett Road to the left. Tower Hamlets Parks Dept have produced 3 tree walks in Victoria Park [click here]. There is a website for Mile End Park with maps [click here].